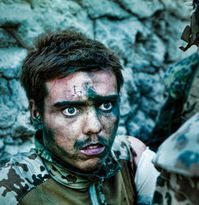 This documentary, like the one I reviewed 2 years ago, Full Battle Rattle (see below), has the same theme, but this time, instead of Americans, which is often the topic of documentaries in Iraq and Afghanistan, it deals with Danish soldiers fighting the Talibans in Afghanistan. The film starts off with these soldiers training in Denmark, preparing to go to Armadillo, a base shared with British soldiers somewhere in Taliban country. I admire the courage of Metz who actually films footage of these soldiers as they engage in battle with the Talibans. Some die, others wounded, but the rest come back safely to Denmark, with friends and family welcoming them back. The postscript shows some of these soldiers going back again to Afghanistan for a second tour of duty. This documentary records what American soldiers who are deployed to Iraq have to go through to prepare themselves for the conditions they'll be facing. In California's Mojave Desert, the US Army has built a billion dollar set of simulated villages similar to those of Iraq and populated it with hundreds of Iraqi role-players. The soldiers spend three weeks inside the simulation before being sent to the real thing. In the directors' statements, the futility of war is the theme of this film, as they reflect the general anti-war sentiments of most Americans. However, no anti-military byass is expressed which makes the film objective and verite. The film was well edited and the approach was done in such a way that it presents real people in an extraordinary situation. There are also interviews made with both soldiers and Iraqis who are now American residents expressing their personal views about Iraq and the consequences of war. Over a long and distinguished career, directing more than 50 films in about half a century, Andrej Wajda (Ashes and Diamonds; Man of Iron; Danton, The Conductor, The Possessed, etc.) has established an international reputation for his films about Poland and its resistance to foreign powers. This particular film has traces of his 1958 Ashes and Diamonds, about resistance fighters continuing the struggle after World War II when Poland became communist. It focuses on a most painful episode in modern Polish history: the massacre of more than 20,000 men at the hands of the Soviet army in the spring of 1940 in Katyn (Belarus). What impressed me about this movie was its cinematography. The camera shots were so effective. Although there were moments when a close-up would take too long, as in the scene when Anna (Stanislawa Celinska) asks an old man where her husband was, the camera took too long focusing on her face before the old man replied. But other than that, all the other shots were well-executed, and you could hear a pin drop in the theatre as the audience was totally engrossed in the film. The ending of the film is a tragic one, and those with weak stomachs shouldn't dare see this film. It was quite brutal. This film interested me because I was a Visiting Professor a few years ago at a university northeast of the Czech Republic, close to the Polish border, around an hour from Auschwitz and Krakow. And memories came back to me of the tragedies of war, and also the misfortunes of countries like Poland and the Czech Republic who were caught between the devil and the deep blue sea, as it were, i.e., between Germany in World War II and the USSR in the postwar era. The Czechs and Poles had told me horrid stories of both these regimes that ruled over them for decades, especially the Soviets. This is an excellent film and I highly recommend it. I've admired Wajda as a filmmaker, and have reviewed some of his films in the past.